You are the current highest bidder! To be sure to win, log in for the live auction broadcast on 11 Apr 2018 10:00 BST or increase your max bid. 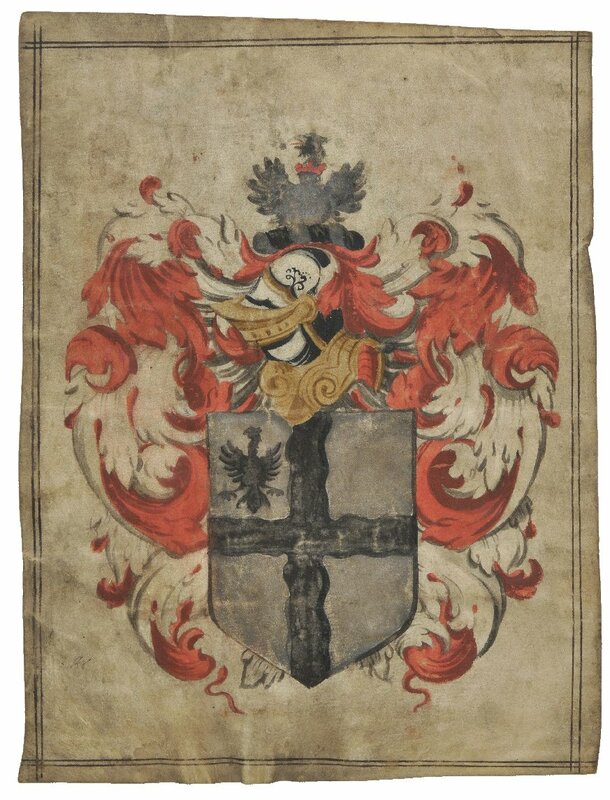 It is possible that the painting was taken from the grant of arms by Robert Cooke, Clarenceux King of Arms 1567-93, in 1587. The style of execution is of the late 16th century period. The painting shows the arms, crest, torse, helm and mantling edged with a double-ruled border line which is often seen in grants of arms of this period. The blazon is recorded in an early 17th century script to the reverse 'Argent a Crosse waved & in the first quarter an Eagle displayed Sable. The Creast on a wreath of his colours a demy Eagle displayed Argent the wings pellettee gorged with a coronet gules by ye name of Webb'. The elaborate mantling is Gules doubled Argent. These arms and crest are recorded in Harley Ms. 1359 fo.108, 1422 fo.61, Add.Ms. 4966 fo.57, Lodges' Ms. fo.13i and QCOx.Ms. 146 fo. 244 as granted by Cooke to Henry Webb in 1587. In the lower left hand quarter of the panel are two faint initials, which appear to be RC. A scarce survival from this late 16th century period, being intact with gold and silver still pronounced. An additional commission of 3% plus VAT (3.6% inclusive of VAT) on the hammer price is payable to The Saleroom (ATG Media) for use of the live auction facility. This charge will be added to your invoice automatically.